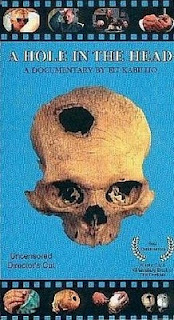 This is a documentary about people who drill a hole in their own head, just to get happy. Really. I know it sounds too silly to be true, but I can assure you it is for real. "Nooo, this can't be. There can't possibly be a documentary that groovy!" But there is. And it's actually so good, by the end of it, you might actually consider getting a hole in your own head. Thank you very much for such a great documentary! I remember watching this on the Discovery Channel when I was a teenage. I really did want a hole in the head after watching it. Good thing I've come to my senses in the intervening period. This is such a fascinating documentary. Glad I found it again.